Ahead of the launch of the Observatory of Public Attitudes to migration, its director Andrew Geddes tells EURACTIV.com that a better understanding of attitudes can help to craft informed policy debates and shift public attitudes. Andrew Geddes is director of the Migration Policy Centre at the European University Institute in Florence and will lead the Observatory of Public Attitudes to Migration (OPAM), which will be launched this week in Brussels. He spoke to EURACTIV’s editor-in-chief Daniela Vincenti. You are launching this week the Observatory of Public Attitudes to Migration. Is there a need to launch such observatory? The most immediate and compelling reason for OPAM is that immigration is and will remain a key issue in European politics. There is currently no centre dedicated solely to understanding why people have the attitudes they do to immigration. Crucially, attitudes to migration need to be understood not as exceptional but as similar in their formation and structure to attitudes to other political issues. People are not like goldfish with minimal attention spans forming and re-forming their views. Like attitudes to other issues, those on migration have powerful roots in early life experiences and tend to align with views on other issues. Perceptions over fortress Europe have in the past exacerbated the debate over migration. Do you think the EU has managed this debate well? What could we have done differently? It’s clear that the crisis has had effects. One key effect has been to activate latent concerns about immigration amongst some sections of the population. Perceptions of disorderly or chaotic movement are likely to be found alarming by people with more ‘conservative’ value orientations who favour stability and order in their view of society. It’s easy to be wise after the event, but messages on migration need also to appeal to those that can be labelled the ‘anxious middle’ who are neither implacably opposed or strongly in favour of immigration. It’s unlikely that such people will respond positively to messages that emphasise mobility and diversity. It is important that people who have more progressive values realise that many of their fellow citizens don’t share their views. Surely perceptions and attitudes are linked to policies adopted or not adopted. Will your observatory limit itself to monitoring attitudes or also propose ways to have more informed debates? Through the OPAM we aim to show how policies can have effects on attitudes. But we would also argue that the factors that play a key role in forming and shaping peoples’ attitudes to migration are formed at a much earlier stage in their life and are quite resistant to change. This means that people are likely to interpret policies through their already-established values. Is there really a model for informed debates to shift attitudes? It’s unlikely that there is a specific model that can be used. It might be interesting to turn the question around and say that a better understanding of attitudes can help to inform policy debate. Sometimes it seems that political leaders are fearful of public attitudes to migration. This is potentially quite dangerous because it could mean that one of the key questions for democratic politics in Europe there is a reluctance or unwillingness to engage with the concerns of citizens. Populists have used migration issues as a tool to gain more voters. Do you think that protecting Europe’s external borders more effectively in places like Greece, Italy, Bulgaria and Spain can alleviate the bias? The OPAM project shows that there is considerable stability in attitudes to migration in Europe. This may seem surprising because people would imagine that there is a lot of hostility. We would argue that this is not the case for the population as a whole, although, that said, there are important variations between European countries. What we would emphasise is the importance of issue salience. By this we mean not generalised concern about immigration, but rather specific concern by people who see immigration as one of the most important issues for their country. This concern can be activated by high levels of immigration or a strong media focus on immigration as occurred during the ‘migration crisis’. For those who do feel this concern, it’s likely that they would prefer to see immigration that is more ‘orderly’ and to see the beneficial effects that it could have on their society. More effective border management could be part of a solution in the sense that it can lead people to be more confident or supportive of their political leaders, but it is very unlikely to be the whole solution. Put another way, border control is not some kind of magic bullet that can resolve the migration and refugee crisis in Europe or reshape public attitudes. 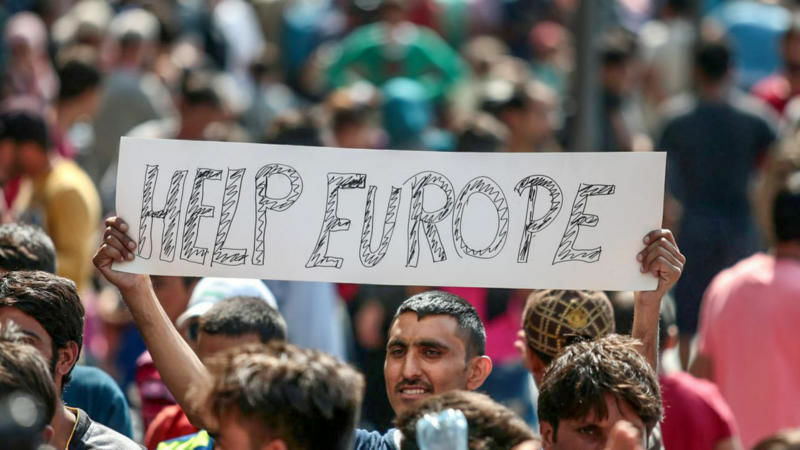 This month the European Court of Justice has just dismissed Hungary and Slovakia’s legal challenge to the quota system, which was devised at the height of the migration crisis two years ago to relocate thousands of refugees in under-pressure Greece and Italy across the EU. How to change the perception on migration in countries like Hungary and Slovakia? The OPAM project would suggest that it can actually be quite difficult to shift attitudes to migration but that doesn’t mean that they are fixed and never change. For example, younger people tend to be more favourable to migration so we may see change over time. That said, if a government and the media are very negative about migration, that means that it might make it harder to shift attitudes that are quite entrenched at an individual level. In his State of the Union, Juncker said that Italy is saving Europe’s honour in the Mediterranean. Is that the perception across Europe? Juncker’s words point to the issue of solidarity within the EU, which as we see has been weak and there has been a reluctance to share responsibility. It may be the case, as Juncker says, that Italy is saving Europe’s honour; but at the same time, immigration is becoming a key political concern in Italy and may well be a shaping factor in the 2018 elections. Juncker also said that legal migration is a necessity for Europe as an ageing continent. Why is it that Europe struggles to warm up to the melting pot which indeed made America great? There are many who would agree with this point of view. The OPAM project would suggest that we think about the message and the messenger. It may be the case that an appeal for regular migration can find support if ways to communicate those messages can be found that resonate with people who have more ‘conservative’ value orientations that favour stability, conscientiousness and order. This may involve talking about ways that regular migration is beneficial and that the people who migrate make important contributions to the places they move to. Another issue is the messenger. To communicate this message, we require political institutions and political leaders that are trusted. Europe’s political leaders still have work to do to recover this trust. Best is to send the migrants back then establish schools to bring the 3r world people up to snuff. With education, jobs and status at home, there would be no drive for migration. NGO’s often are not in a cohesive drive to a goal. Saving babies when there is not the infrastructure for education nor the exploitation of resources to provide income to finance income production. Construction of a system to aid in a great educational system that is the beginning of income growth with job growth and upgraded conditions is the best way to dealing with migration.